Check out this very informative article about how to choose “the best golf putting aid” by Dominic J. Leon. Dominic is the author of ubergolf.net. The website provides holistic literature towards helping golfers improve their golf game. Thank you for reaching out to me Dominic and providing me with this very informative article to post on golfaidreviews.org. When it comes to golf and putting in particular. 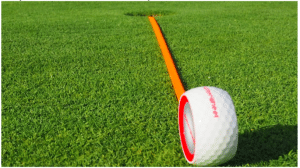 you may get an advantage or improve your game by using a golf putting aid. To determine the correct golf aid it will depend on what your strength and weakness. It is important to realize that there are tons of golf aids on the market and many of them are not really worth wasting your time and money on. Be sure to choose a quality aid that is really going to help. Remember, it isn’t always how much a training aid costs it is how effective it has been in the past with other customers. Which Training Aid is Most Appropriate? How will it help you ? In order to understand which aid is the most appropriate you need to figure out what your areas that need improvement are. Isolate the issue and find the training aid that will help you to correct the issue. Most of the training aids that actually help are simple. That is not true every single instance but generally simple is better. A golf putting aid will help you to learn exactly where and how to hit the ball to get it into the hole more often. If you are not hitting the ball right it will not roll correctly. If you swing is off or you are hitting with the wrong amount of force it will give you a visual cue so that you can correct the issue. Being able to learn how to have the right technique for your swing can be very challenging. The motion does not tend to feel natural if you are just beginning to learn how to play. There are golf swing training aids that will help you isolate certain areas of your arm so that you use the right areas to swing your club in a pendulum motion. How to swing a golf club, how to improve your golf swing. Please read carefully the attached instructions for each product, or learn from the personal blog of golfers. One of the most important concepts when learning how to make the perfect shot is control. A good golfer needs to learn how much strength to use when making a shot. In order to improve control, it is important to have a golf aid that helps you focus on learning how to use your strength the right way. 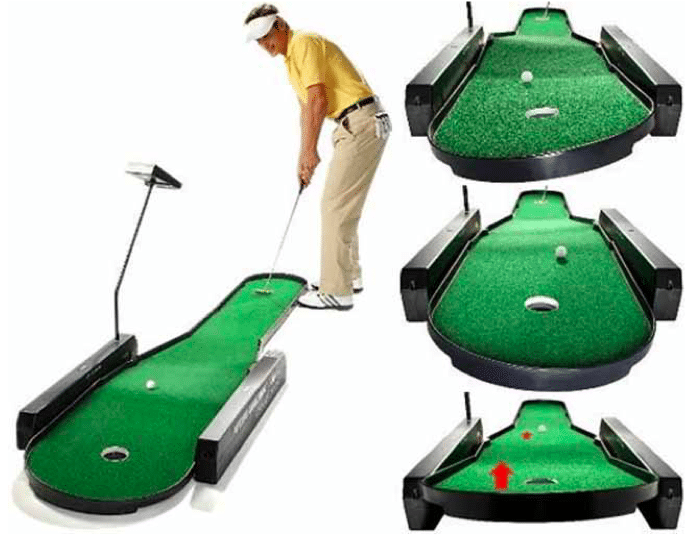 How to Choose The Right Golf Putting Aids ? 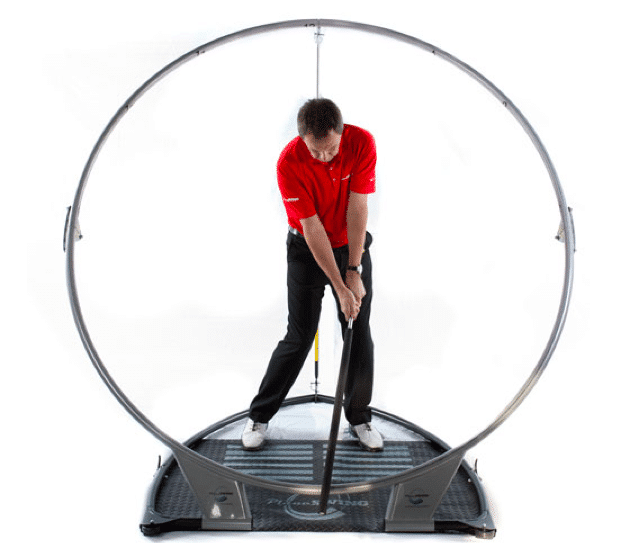 A bit of homework is required when deciding on the right golf training aid. You should have in mind what you are trying to correct or improve in relation to your game and technique. 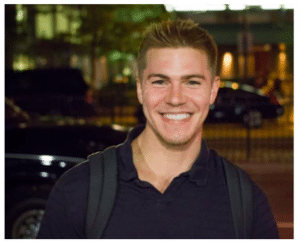 You may be wondering how to go about finding the one that is going to help the most? A good way to get started is to research the products that are on the market that is designed to help you improve whatever issue you are having and then read the customer reviews for the product. The customer reviews are a great way to gain insight as to whether or not the aids are really effective and what percentage of customers believe them to be a good value for the money. If there are any issues with the product or particular concerns you will be able to know about them before you decide to make the purchase rather than finding out the hard way. Customer reviews and ratings are an excellent tool for any potential buyer. There is golf putting aids that can correct a specific problem such as accuracy, power, and swing technique. These are a few of the top rated and most effective aids available on the market today. They come in many forms to perform a specific function. It is up to you to figure out where you need the most help and then you can check one of them out for yourself. Aids such as The Putter Wheel golf trainer will visually show you how and where to hit the ball correctly so that it rolls directly into the cup. This particular aid is basically cut off on one side so that you must hit the ball precisely in the right spot to get it to roll in a straight line. This product has a high rating on customer reviews and it is priced at around $15 to $20 which is a fairly good deal. If you need a bit of assistance learning just how to hit the ball to make it roll in a predictable fashion then this might just be the thing you need to help you improve your game substantially. There is a product that is called The True Pendulum Motion that will attach to your putter. It is designed to help you learn how to feel what the right technique feels like. 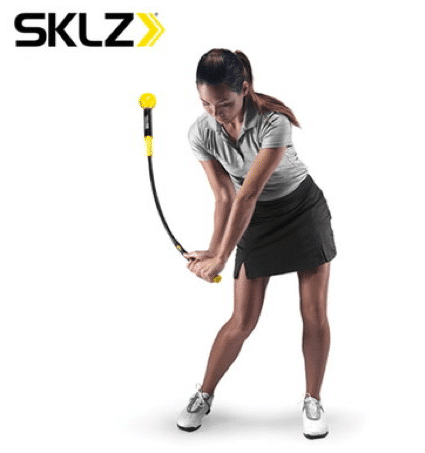 This particular product may be a bit large and rather complicated but it seems to work really well for many golfers that are learning how to perfect their swing. Even though it feels odd at first it is really designed to mimic the way a proper stroke is supposed to feel so that you can overcome the unnatural feel of a proper swing. This aid will run around $90 to $100. If you really need help with your swing and you have a few dollars to spare then this might be worth a look. Perhaps you need assistance with your accuracy. If this is the case there is easy to use training aid that will help you to get the ball where you need it to go. The Eyeline Golf Circle Target is designed to help you aim more accurately by using visual sight lines. 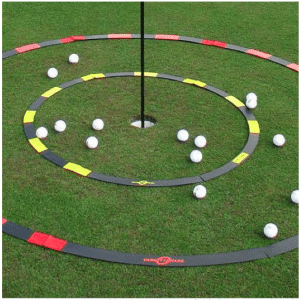 This golf aid is a set of circles that surround the hole and there are visual markers that are used to aim and shoot the ball to the right area. It may seem simplistic but once you begin using this aid you will see that you gradually begin to learn what actions and sight lines are the most effective. This particular product runs around $30 and is an economical way to make a substantial difference in your overall accuracy. I am Dominic J.Leon. At my website ubergolf.net, we provide holistic literature towards the development of your golf career. We have all the information you need to bring your A-game to the golf course. We will arm you with comprehensive knowledge about all things golf, from the best golf gps watch to all about indoor golf. We specialize in buying guides, reviews, how-to tips and golf nutrition tips. If you would like to learn and grow with us as a golfer, do follow us on our website.